Secret is in the blend! Serious tea drinkers know that it starts and ends with the quality in the leaves. Hannah's signature blend features organic white, green and black tea, rooibos and yerba mate for added flavor and health benefits. All organic and fair trade whenever possible. Hand blended - so you know that you are getting only finest quality ingredients infused with lots of love! Also great for sipping, this blend boasts a bevy of benefits (whew - say that 10 times fast!). All of my own Hannah's Homebrew Kombucha is made with this blend. Perfection in a bottle! HSB is in all of our Continuous Brew Packages. Quality you can taste! I bought Hannah's Special Tea Blend and I love the taste. Not sure yet if my kombucha loves it more but I know I do. The taste is very pleasing in a cup or in my kombucha. No way to measure the health benefits but with the good benefits of the teas involved it has to be good for me. I would definitely give it 5 stars and will continue to buy it. Out of this world. I buy it by the pound and drink it by the cup. I switched to this from using a cheap generic black tea bag source. The taste is milder but much smoother and better tasting. It's great knowing that it's a much higher quality tea than I was using before and organic. My scoby seems to be growing faster using this tea! I purchased this tea blend along with my first scoby. I will never use another tea for my kombucha. It makes the PERFECT tasting Kombucha. Every batch has been delicious and perfect. I bought this for my Kombucha but we started brewing it for our breakfast tea. It is wonderful! I can't wait to taste the difference in my next Kombucha batch. Review by Marianne S., Cottonwood AZ 2/8/19 I've only recently tried this blend, and really like the mellow balanced flavoring it provides my kombucha. Hi! I love Hannah's special blend--it makes the BEST brew! My friend gave me some and it is now the only tea we use. 5 stars! The cloth covers are great-- nice fabric and quirky patterns, too. 5 stars. I am so glad your big book of Kombucha is well written--I refer to it often. 5 stars. Your service is fast & we love your products. Terrific tea blend, with a fresher, livelier taste than anything I can buy in the store. Makes a great kombucha just by itself and combines well with fruits and other flavors, doesn't fight or overpower them. By Kim Humiston 12/23/18. Hands down this is the best tea available. I actually use this half Nd half with decaf black tea, and it is amazing. I do not have to add flavoring. Will definitely reorder! I love Hannah tea mix because the taste of my Kombucha brew comes out great. I struggled for several years to find the perfect tea blend. This is the one for me. I continue to use Hannah's Special Blend, after trying others. It makes the best flavor kombucha for my taste...and my scoby's love it, too! Being new to brewing I started with this tea since it had great reviews and there are already seemingly endless variables with DIY Kombucha, now I've fallen in love with the taste even of my 'plain' brews, and have made consistently great 'booch. I'm a believer. I agree with the rest of the positive reviews. Started using this tea a couple months ago. It is so much better than off-the-shelf green/black teas. A wonderful flavor. It is worth the price. You sent a starter of the tea for my first brew along with my job kombucha culture order. I ordered more the next week as I placed an order for Jun culture too. Your teas are so smooth and yield delicious kombucha. I highly recommend this for kombucha brewing and the Green Goddess for the Jun. This is the best tea for continuous brewing! It is organic and the flavor is flawless. I don’t even add any flavors because it tastes so great. I highly recommend it! I start my mornings with this tea.A little goes along way. This tea produces a very light and effervescent Kombucha. Well done, Hannah! I love this blend for my continuous brew system! It is the best around! We have been using this tea for some time now and just love it! Thank you! I used this blend to make my first continuous brew batch and I am loving the results! I always used to use plain black tea for kombucha, but I really enjoy the taste of this blend! I will definitely keep using it for future batches! Hannah's Tea Blend is so good that we brew it not only for kombucha, but for our iced tea. If 6 stars were possible, it would be for this! We will definitely order more. Thank you so much! I started brewing kombucha about a year ago. At first I just used black tea bags from the store. I came across the Kombucha Kamp website and decided to try this tea blend. I haven't gone back to any other kind. This tea blend makes much better tasting kombucha and we definitely prefer it over any other tea I have tried. I just placed another order since I am running low and definitely don't want to have to make a batch without this tea! Really flavorful tea. I have been dabbling in making Kombucha for about 6 months now, and I'm really pleased with this tea blend. I am a newbie to making booch. I am on my 2nd batch brew and have used Hannah's Special Tea Blend for Perfect Kombucha each batch. It has such a wonderful medley of flavors and now, I cannot imagine using any other tea for my brews. It is perfection and its name says it all. Thank you Hannah for creating this tea blend. Hi, your teas are the best ever; I've been buying from you exclusively for years, and make the best booch ever thanks to your product. Also appreciate speedy delivery and excellent customer service. Five Stars. I've used several different tea blends when brewing my kombucha, and decided I would give Hannah's blend a try based on all the good reviews it received. I have not been disappointed! The flavor that her blend gives my kombucha is the best out of all I've tried and I plan to continue using it. I've been brewing for a year(12 gallons every 15 days :) )and this the best blend for my kombu, I don’t even have to add flavor, because the taste by itself is wonderful. Very nice blend! And much easier than my trying to get all the different teas myself. Organic and fair trade is important. I am very sensitive to caffeine so I wanted to use white tea. This blend is great. It's not giving me any caffeine reactions. I'm looking forward to bottling with the flavors I ordered from you that arrive today, especially the root beer. I've been brewing 10 years now and have always used Hannah's blend. I now run 2 CBs, one regular and one Hannah's blend/hibiscus. I've tried other teas but love Hannah's blend the best. I have tried other teas from other companies but this is the best hands down! Thanks Hannah for making great Kombucha Tea. Even my husband who has been wishy washy about kombucha drinks store bought ENJOYS the flavor of this tea blend! Love the tea and Kombucha Kamp!! I have 2 continuous brews going and love making it and getting my mom started with her brew!! Always great products and service!! Hannah's tea blend is over the top. Makes great kombucha and I recently reordered it for both my daughter and me!! this is an excellent blend for kombucha, it even tastes good without flavoring. it's the only one i'll use. 5 stars. Great products, perfect kombucha! Hannah's special teas are a must have for consistent, wonderful flavor straight from the brewer or bottling and refrigerating. I am having fun experimenting with 2nd ferment flavoring options and carbonation. This tea blend makes the best kombucha. Taste way better than just using green and black tea! Excelent selection of teas mixed in really nice ratios to produce a delicious tea blend and Kombucha brew. This blend makes such a nice tasting Kombucha. Thanks so much - it's amazing! I am very satisfied with my purchase, the process was easy and I got my tea promptly, well-packaged and sealed. The tea tasted very good and I will have my first Kombucha tea batch in few days. I will buy again. Thank-you for returning my phone call the same day l left a message even though it was a holiday. My questions were answered and l received my items in just a few days. I fully contribute the success of my brew to this blend of tea. Perfect kombucha every time! My Husband & I made our first batch of kombucha with Hannah's special tea blend. Love this special blend so much & that it's organic. Also enjoy making a hot cup of tea with a Tea Infuser & this special blend oh so Good on a cold winter's day. Wouldn't buy from anyone but Hannah! Thanks Hannah for making such a Awesome Tea Blend! I sure enjoyed this special blend tea. I have tried some others but this one is the one I come back to. It's the best. ❤️ Enjoy. Just made my first batch of kombucha using this special blend. Very satisfied with this product. So nice that someone else has already figured this out and made the experience that much easier for me. Hannah's Special Tea blend is superb! The kombucha that brews during the first ferment is divine and doesn't even need a second ferment! Great combination of teas and I love that it's organic! I will definitely be purchasing this again. THANK YOU, HANNAH! Once I used up all the special Hannah's blend that came with my starter kit I thought I'd just use organic black tea bags but the flavor is just not as robust. Also, after making Kombucha with Hannah's blend I would make a big jar of hot tea with the "spent" herb and I loved it. Even though I do a lot of herbal tea blending myself, I just LOVE this one. I actually returned to the site this morning to order more. Thanks Hannah!!! I tried other teas at first but yours produces a consistent batch every time so no going back to other brands or mixes. I've found my favorite! Tried many different teas in the past, but Hannah's Special Blend is the WINNER! Great combination making a wonderful flavor to savor. Made my own continuous brew bucket, but used all KK supplies (scoby, tea, starter.) My kombucha works, i easily decant over a gallon a week already after 3 months. This tea blend makes my kombucha taste like an Arnold Palmer. Very distinct lemon/citrus and a very smooth tea flavor. Ordering a pound! I love the flavor of Hannah's blend, and the healthy SCOBY it produces. You can't go wrong with this blend. I love the Hannah's Special Tea Blend to make kombucha. Great flavor! What a beautiful blend! A great combo for great flavor and health of your scoby AND it's organic! You can't beat that! Thanks Hannah! I'm new to brewing and when I ordered from KK , I just decided to go with Hannah's Special Tea Blend. It's perfect. Thank you for making my Kombucha experience fun and delicious! 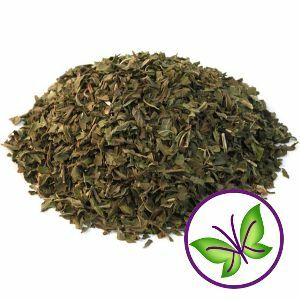 We really enjoy this organic tea blend! After brewing for the kombucha, I reuse the tea ball to make a hot cup of tea just to drink, it's so good! I received this type of tea with my starter kit and although I am not the tea snob, I can see this is very good quality tea. In years past, I drank a lot of store-bought tea and it always had a dark color if it was strong. When I first brewed with this type, it came out with a light color and I thought it was not strong enough, until I tasted it. It is great! The perfect blend for rich and well rounded flavor. So convenient and delicious! All I can say is that this blend is sooooo good! I love the Hannah's Perfect Blend of tea, it makes delicious kombucha every time. People who say they don't like kombucha drink it too! My tea arrived quickly and well-packed! This tea blend is just perfect and produces delicious kombucha every time! I like to use 5 tsp per gallon. Tastes great without adding flavor but if you want to add flavor I highly recommend strawberries and ginger. Organic of course! Just delicious!!! This blend produces a delicious, well rounded batch of Kombucha; perfect for flavoring. I like to add ginger and pear when bottling. Delicious! I started out with this tea blend when I got my scoby. After it ran out I switched to some teas that I had. I have since switched back and bought a pound of tea last time. It makes a really nice tasting kombucha. There is a difference. Excellent blend. Hannah's Special Premium five tea blend was recommended to us by a friend for our kombucha. It quickly became our favorite tea to use for making kombucha. All of our batches are smooth with a lot of carbonation. We have completely stopped using all of our other teas. 5 stars. Once again, we are very satisfied. This is the only tea we use. We don't even have a desire to try any other flavor. Thank you Hannah. I just want to say thanks for such quality products and great customer service. I love Hannah's special blend tea for making kombucha. I just received my order which included ginger and gogi berries and can't wait to use them this weekend. I have tried other teas from KK, but I keep coming back to Hannah's Special Blend. It is by far the best and makes for great tasting kombucha! Hannah has perfected this blend. After using up Hannah's tea that comes with the brewing package I bought, I tried to go a little cheaper and just got some organic tea from the store. I will never do that again! The Kombucha tased different, brewed different, and looked different. Let me add, not a good different either. I came back to KK and ordered Hannah's blend, drained my entire brew, and basically started over. Learn from my mistake, buy Hannah's. This tea blend is absolutely delicious!! I received a tea bag of Hannah's signature tea blend when I purchased two new scobys. After using my own green and black tea blend for several years, I had forgotten how delicious Hannah's blend really is! The new scoby that was "born" is so very thick, perfectly formed and the komucha is delicious. I have to say...I guess I am just going to have to buy some more of Hannah's tea blend to keep the good vibes and successful brews coming.Thanks, Hannah! My trust is in you. This tea is so smooth. It produces a strong scoby and just the flavor we have come to love. I will continue to use HSB for my brews! I have consistently purchased Hanna's Perfect Blend. Why chance it on any other? It has a great flavor and my brews are always consistent. I attribute my improved health to KT and started my journey from a tough spot with Kombuch Kamp. Lifetime customer and Perfect Blend lover. This tea is a perfect blend! I tried regular tea when this blend was all gone. Taste is completely different, I wish I could pick this Blend up in the grocery store. Organic and delicious! I love this tea blend. I tried the variety pack and this was my favorite of the three. Makes great Kombucha. I've been on a mission to find my favorite tea blend and have settled on this one. Cold or hot, this is the pefect blend for me. Plus, I know I will get a personal touch and great customer service every time! Excellent blend. Nice smell and flavor. Made great buch. This is my new go to tea blend from now on. Got this and made kombucha with it and my SCOBY just loved it. Starting booming and getting huge. It makes your second fermentation have a great flavour. I'll be back for more. This is the best blend ever. Even after I make my sweet tea for my kombucha I use my tea ball to make a cup of tea with the tea leaves again. It is delicious! This is the no think method to brewing Kombucha. I am grateful for it! I experiment occasionally with other types of tea, but this is my number one go-to blend. Yum! I have ordered and re-ordered Hannah's special blend because it is the perfect kombucha tea! Love the flavor and it is always fresh and delicious...and organic! Thanks, Hannah! Wow! I feel so lucky that I used this blend for my first attempt at making kombucha. I love this tea! I'm almost afraid to experiment with other blends because this is so good! I'm hooked! Hannah's Perfect Blend is DELICIOUS!!! Hannah's blend produces a perfect brew every time. This beginning kombucha enthusiast could not be happier! Thanks! 5 stars out of 5!!! This tea has a pefect balance-it's smooth, slightly sweet and wonderfully earthy. The batch of kombucha I made using this tea tasted so fantastic there was no need for flavoring. As well, the fermentation done with this tea, as compared to standard store bought black tea in a bag, was far superior. Very satisfied customer. I have used this perfect blend of teas for two years so far. It is deliciously smooth and my scobys are always happy and healthy. This is my favorite tea. I can't wait to order it again. This flavor as a plain kombucha rocks! Ok... I love this combo so much, I used the spent tea to make a cup to sip on afterwards. New to brewing, this tea mix came with my kit and, for the first time ever, I happy drank the kombucha unflavored and unadulterated. It was smooth and well flavored. Thank you Hannah!! This tea makes the most excellent Kombucha! It's truly the perfect blend. Hannah's Special Tea Blend makes Kombucha taste just like GT Dave's original. Also the tea smells DIVINE when you open the bag. I have given away so many samples to family and friends I was obliged to order a large box of replacement tea. Additionally it makes very good brewed tea and I love that it is organic. This is the best tea blend I've used after trying "brands" and other loose leaf tea. Hannah's special blend is delicious! I I am fairly new to making Kombucha and have been using your jasmine tea. I ordered this to try something new and it is fabulous. I don't even have to add flavorings to this. Thank you Hannah. I have to admit, I was a little skeptical of all the 5 star reviews before placing my first order with Kombucha Kamp. I mean, NO ONE gets all great reviews all the time, right? Well, KK is getting 5 stars in my review, too. -	I’ve ordered 3 times and each time I received shipment notifications within hours and my orders arrived within a couple of days. -	My SCOBY is beautiful and thriving. I’m on my 3rd batch of brew now. -	Hannah’s Special Tea Blend is delicious. I will be sure to keep that on hand at all times. -	The Big Book of Kombucha has to be THE definitive book on this topic. HIGHLY recommended – especially for newbies. This tea is packaged in an airtight mylar lined bag, making it resealable and fresh. Tea tastes great and gives you a good mix. This makes the tea making process effortless and surefire. I love this tea blend for making my Kombucha, but also when I just want a delicious cup of hot or ice tea I always use this blend. It's the best I have ever had! The tea looks beautiful and smells fantastic! Exquisite quality and my kombucha made a large perfect SCOBY very quickly. I guess the SCOBYs like the tea also. I recently ordered the special blend loose tea and was so happy to see a cloth tea bag was included! I love this company's customer service and knowing they are always there to help me brew the best kombucha possible. I really enjoy this blend, it tastes great and makes me feel more healthful and vibrant. I also like how easy Hannah makes it to get started. Thanks . Organic and fair trade...what more could I ask for?! Well, how about a tea that makes a wonderful smooth tea with a exquisite aroma! So far when sharing my Kombucha with newbies I have only heard positive comments about this blend! I will be using this one regularly and can't wait to try some of the other's that you have! Best tasting kombucha tea we have made yet! I will never buy a different mix, this is perfect. This tea really does make the most delicious kombucha I have ever had! I love the loose tea in the ball ... very comforting not to have so much waste (the tea leaves go right into the compost bin). Thanks, Hannah, for all that you do. love this tea and will probably continue to purchase it. makes perfect kombucha every time. i love that it is organic and fair trade. I absolutely love the Hannah's special tea blend. I started making the kombucha with just black tea however I tried a sample of her tea blend and fell in love. It completes me! It is fantastic and I will not make my booch without it anymore!! Love this tea! I had been using just plain black and green tea for my Kombucha but love this tea the best! It makes great Kombucha and only takes a few teaspoons. Love the brew and lovely little scobies that come out of this!! Shipping time is amazingly quick. Have had amazing transactions!!! I'm new to brewing kombucha and received a sample pack of this tea blend as part of the no frills continuous brew system. I was going to use black tea but love the flavor of Hannah's blend so much that I plan to use it instead for future batches. I also buy organic as much as possible so this tea is perfect for my kombucha. Hannah's Perfect Blend is perfect for making Kombucha. She has truly found the perfect blend. I just bottled my first brew - everyone in my family who has tasted my Kombucha thought it was REALLY good. My mom asked that she be given some for Christmas. I believe Hannah's Special tea blend (5 stars) has a lot to do with the flavor. Based on all the reviews I read, I splurged and bought Hannah's special blend instead of store bought tea. WOW! It really IS perfect! I have two continuous brews going so far, and it taste's exactly like the brand I loved before brewing my own! Instant success! This special blend tea has been fantastic; my kombucha is thriving and the flavor is fantastic, bubbly right from the spout! A must have if you haven't tried this before! This tea makes the greatest booch!! I tried other teas, but none gave me the great flavor & beautiful color of this tea. I'm just about to finish my first bag of Hannah's blend & boy am I glad that I ordered 2 from the start! Nice to know that I have a resource for this perfect organic blend for my brewing! Great blend of teas for great tasting Kombucha. I initially tried this tea when I got a free sample of it with my SCOBY, and I loved it! I have two continuous brews going: one with green tea, and the other with Hannah's Special Blend. My boyfriend and I tend to always deviate towards Hannah's blend when we go to pour ourselves some kombucha, so I think that says it all! Very pleasant blend for drinking or brewing kt. Will definitely purchase more. Looking forward to seeing the added benefits from the yerba mate and rooibos!!! This tea blend is wonderfully aromatic. I will only use this tea blend, it makes the best Kombucha. Hannah's blend has such a delightful aroma & mellow flavor. My husband even likes my kombucha, even if it's healthy for him. I love Hannah's special tea blend. I have only been brewing Kombucha for a short while, but many friends tell me that my Kombucha is the best ever. I feel strongly it is because of Hannah's expertise in combining the right teas together. It is wonderful to brew a batch knowing full well that the scoby is going to love it and then I will when I get to drink it a few days later. I will be ordering more and soon, I sure don't want to run out. Love this tea! makes great tasting kombucha. Way better than the store brands. Will be buying more once I run out. Thanks Hannah! Great taste, will order again! I can't say enough about this tea! I put off brewing my own kombucha for fear I just *knew* I'd mess it up somehow. With KK's SCOBYs and tea, it has seriously been foolproof. The tea is wonderful; fresh, delicious, and fragrant. I need to buy some extra just for drinking straight. My SCOBYs just seem to love it! It's no wonder this tea blend has perfect reviews. My friend from Taiwan came to visit me and I brewed a pot of this tea . She drank the entire pot of tea and wanted more! She said she hadn't had tea that good in a long time. Of course it goes without saying it is my favorite go to tea whether I am making kombucha or just want to enjoy a cup of tea. this tea is very well rounded. As a first time brewer I did not want the hassle of figuring out how to mix my tea. Hannah takes all the work off your shoulders so you are able to concentrate on making a successful batch your first time !!!! This blend was sent with the SCOBY that I ordered. It made the absolutely best kombucha I've ever tasted. Wow! Tasting my first batch of booch made with Hannah's Special Blend tea and WOW what a difference! Strong SCOBY growth & great neutral taste! I flavoured the batch with a local tea company's loose leaf blend of rose petal, lavender, mint, and elderflower, and a couple slices of lemon. It's beautifully carbonated and a nice champagne colour, and tastes like heaven. SO GOOD! Thanks Kombucha Kamp!!! We love it. Friends have said it's the best. I'm on my 4th batch of 'booch' and each time it gets easier to make. I bought my scoby from your site. I use Hanna's special tea blend. I love experimenting with the 2nd ferment. I've only used fruits so far and my favorites are Rainier cherries and blueberries (not together). Last year I made kombucha with organic black and green tea bags from the grocery store. I eventually gave this up because the taste always seemed too vinegar-y when I bottled it, even with flavoring and a tsp of sugar added to each bottle. I wasn't motivated to keep up the process, mainly because the flavor was just too sour. I recently switched to continuous brew and started with a new high quality SCOBY from Hannah, plus HPB loose tea leaves instead of tea bags....WHAT A DIFFERENCE this tea has made in the taste of the kombucha! We bottle from the spigot now and don't even add any flavoring. So my husband and I are now absolutely hooked, we bought a second crock to try and keep enough around. Helped us kick the diet soda habit once and forever!! I also would highly recommend Hannah's Big Book of Kombucha - just full of information that will set you up for successful, tasty and healthy brewing. GREAT JOB HANNAH! Sometimes you get what you pay for. This is the absolute best tea blend for Kombucha that I've ever used. Outstanding. Incredibly fast shipping. This was a great brew. The brew was mild yet flavorful and delicious. This tea is delish!!! Now my husband is addicted as well! Great taste! This blend makes a perfect KT. Thank you! I love Hannah's Special Blend. It makes the perfect KT in our Oak Barrel. My Scoby LOVES this tea blend...organic makes all the difference. Had a issue with one of the bags; the customer service was incredible. Will be a loyal customer, appreciate the quality. Love, love, love this tea! My kombucha is so much better than the store bought and a lot less expensive! Highly recommend this tea! Aloha! I recently received your K tea blend. I really enjoy making my K using your mix of teas. Also I enjoy it as a regular tea. I have been brewing K for over six months and your special blend make it just delicious. Mahalo! Everything was well done. Tea came promptly. Product is always excellent. FIVE STAR*****service. The tea is delicious and I will be getting a lb the next time. But perhaps the best thing about Kombucha Kamp is how generous they are with their information. Thank you so much! I am very grateful. I received a sample along with my original SCOBY and wow! Love! I ordered 1 lb of Hannah's Special Blend and it's all I use to make my Kombucha. My SCOBYs are growing like crazy and the brew is delicious! I received a sample of this tea when I purchased my CB setup & now I've purchased the large quantity because I loved it so much. I purchased some other items to add flavors like elderberry, chai spice, ginger, & Brain Brew & I can't say enough that each one of those added new & exciting flavors. I will be buying more of each. Great taste. I like this blend so much better than my plain black tea. I ordered a second bag long before finishing the first. I don't want to run out of this ever! I started continuous brewing with this blend, and my brew turned out great. I considered combining my own, but thought "why mess with success". Thanks for putting out a great product, and for all the helpful instructions and content. Hannah's Special Tea Blend is by far the best for making my Kombucha. I've tried many teas including blending my own, but nothing compares to the smooth taste of Hannah's. Give it a try I think you will agree! This is such a wonderful blend. I'm so glad a sample came with my system-I probably would not have tried it. It makes such great kombucha I've reordered more. Best of all it ships for free! Received tea yesterday. It came so fast. Love the taste. I also purchased the stainless steel tea ball and cant believe the difference in the taste. This organic blend is the best I have ever had. Thanks so much! Love the variety of flavors in this blend of tea. It makes the best kombucha that turns out perfect everytime. Thanks again for the prompt service KK! Been brewing 3 yrs now with hannas blend and have tried my own blends only to be dissapointed. As always,this blend is perfect! 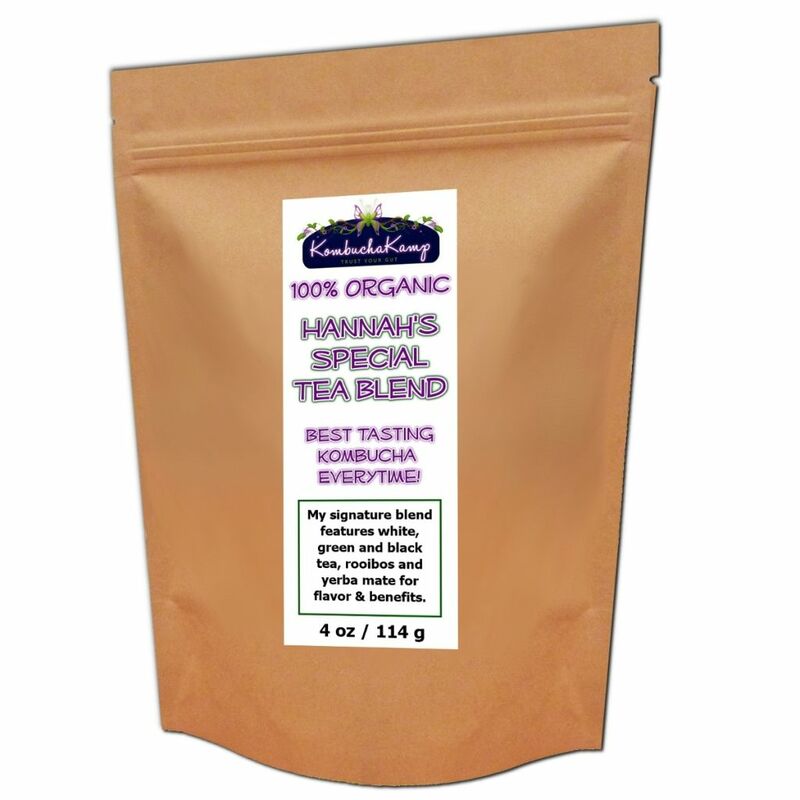 Hannah's tea blend produces a mellow and flavorful brew...the complex and subtle flavors taste so good! I think that anyone who is not sure they like kombucha would find that they would love it if made with this tea blend. My order of Hannan's special blend was shipped quickly! Made my first batch of Kombucha. House is a bit cool currently so I am still waiting to get to that "sweet spot" for taste. Can't wait to taste and experiment with flavors for second fermentation!! BTW, I have used the blend to just brew a cup to sip on...very nice and mellow blend! I made my very first batch of KT with a Ceylon and oolong blend and it was delicious. I wanted to try other blends and found Hannah's blend to contain all the teas I wanted to try all in one. It made a smooth yet rich tasting KT and I really love it. I've tried a few other teas and honestly I can't say I've tasted a brew yet that I didn't love. If it is weak I let it second ferment a few days on the counter. If it brews too long and gets too sour, I use it in a sweet wine and it balances out perfectly. Hannah's devotion to Kombucha really shows in the quality of her products, generosity of information and custom design of all things KT! We've loved this tea blend! We haven't used any others, but haven't seen a need to since it produces great tasting kombucha and healthy scobies. We love Hannah's special tea blend. We had been using organic black and green tea bags before switching to this blend. What a remarkable difference in our brew! Beautiful color, delightful smell and so many more bubbles! This is the tea we will be using from now on. This tea is far superior to the others that I am using. The taste is wonderful and it has been hard to decide how long to let the batch go. After a week it had a sweet effervescent quality with just a touch of tangy. I have two continuous brews and two gallon bottles set up with different tea blends and it's a marked difference in flavors. My Continuous Brew set up came with a sample of Hannah's special blend of tea & it certainly out shines the regular green & black tea I have been using. This makes a wonder tasting kombucha, my husband even loves it. Definitely will buying some more....uhmm good! Hannah's Special Blend makes really great tasting kombucha! My whole family loves it just as it is without a second fermentation. I also love that its organic and fair trade too. This is, hands down, the best combination for brewing kombucha. The taste is excellent and it keeps my scoby very healthy. I've been brewing with my scoby and this tea for well over a year and my brews are going strong and my scoby is incredibly robust and healthy. I won't use anything else. Period. We like this particular tea so well, we don't bother with any other! Thank you. This stuff is the bomb. The flavor is excellent; it's light and refreshing. I love the reasoning behind each tea in the blend. I haven't been getting the fizz that I got when I was brewing just black tea--but I'm still a novice brewer and there could be other factors involved. Despite less fizz (so far) with this, the taste is just excellent and I'm enjoying it very much straight out of my brewer. I've also bottled and flavored it with muscadines, apples, or nectarines. This is a lovely blend of organic tea and makes the yummiest kombucha! My family's favorite Kombucha is the one I make using Hannah's special blend. It is mild yet very flavorful. We are on our second pound already. I love that it is organic! This makes wonderful Tea. Need to get more soon. This tea is beautiful-- it makes such a light, bubbly kombucha that one of my coworkers said it tasted like champagne! What a compliment. I will definitely continue ordering this! I have been using this blend for about 6 weeks. It's wonderful, makes great booch, and I like the fact it's organic and has Yerba mate tea included. I will be reordering soon. I love the taste of this Tea. It makes the best kombucha. I made a batch using Lipton tea and it had very weak lousy flavor never again. I love the flavor of this tea blend so much, I'm almost afraid to try another blend. Maybe I'll start another in a separate jar, but I just don't see how it could get any better. This is an awesome blend. Makes really great tasting Ktea. HI I ordered Hanna's blend tea and a scoby, love them both you guys are wonderful! Keep up the good work. The best kombucha!! Light but so flavorful. great tea blend. I really enjoyed it. I am giving you 5 stars for Hannah's Blend Tea! I tasted it for the first time yesterday, and it is delicious! This tea blend is absolutely perfect! Love this tea! Have been brewing with it for about 8 months now and love my kombucha! Much better than store bought!! I love the tea sample you included with my order. It's delicious! Fantastic blend! Excellent balanced flavor and I can tell the SCOBYs really dig it! I love this blend I've tried others my family just didn''t like any other. keep up the great products love all your experiance with kombucha brewing. This is a lovely blend of tea. It smells wonderful and tastes that way, too! I love it for my morning cup as well as brewing for my kombucha. Thanks for such a tasty blend! I love Hannah's tea and my gota kola enricher for my lovely ageing memory. I am using the cloth tea bags and that feels really nice to me. Great blend to make Kombucha from. I haven't tried it in a cup of tea yet. I got this Tea with My Continious Brew System....Loved it so much I orderd More......What can I say Its The Best My Culture and I Love it!!!!!!!! !Thank You KK!!!!!!!! WOW! This blend is amazing along...and with ginger and raspberries. I am almost out of this tea and plan on purchasing more soon. I have been buying this blend for my Komboucha for quite some time. I like the fact that it is organic and the flavor is wonderful. The tea is delicious, both in my Kombucha and brewed by the cup. Hannah's customer service is impeccable - there was a slight problem with my order and she resolved it immediately. I will definitely be a repeat customer! Hannah's special tea blend makes very tasty combucha which blows away any store bought kombucha! Even my skeptical husband loves it and asked me for more - wow. Try it - you won' t be disappointed! Good job Hannah, you got it right again - 5 stars product with lots of health benefits given by different teas. This tea came with my scoby from the Kombucha Kamp website. I love the blend and can't wait to buy again! This tea blend came as part of the continuous brewer package we purchased in early January. It makes excellent kombucha. The KT made from it has a delicious flavor straight up or used for second fermentation for flavored kombucha. The SCOBY is thriving and growing too. Highly recomment! I love Hannah's blend to make my kombucha. I have two crocks going, a one gallon and a two gallon one, and at Christmas eve dinner with my brothers family I served 3/4 kombucha and 1/4 organic cranberry nectar from Santa Cruz juices. chilled in wine glasses along with the regular drinks and my kombucha was a hit. I just order Hannah's blend by the pound now to keep my crocks brewing all the time. Thank you!!! Your tea blend really is the best. I much prefer to buy from families than stores anyway. With this tea blend my Kombucha came out fantastic. The flavor was lighter and more refreshing than with the black tea I was using. Thanks! Have been using the tea blend for a few weeks. Very happy with the full bodied flavour. Had been making two brews, Rooibos and the other Jasmine, the rooibos did not make as nice a SCOBY as the Jasmine so I switched the rooibos to Kombucha mama blend, I now get the healty SCOBY of Jasmine tea plus the rich flavours from the rooibos and the other teas. I like your products very much!!! We keep on coming back to this blend as the flavor is so great!Wonderful to know that it is also helping to support our health and our "mushroom" too! On my second batch and I love this blend. I was introduced to Kombucha by my sister who uses regular black and occasionally green tea. She always added fruit juice to the finished Kombucha and it was good but I found I like the Kombucha made with this blend best without adding anything else. we have been batch brewing and enjoying it so far. It is fun to experiment with 2nd ferment and seeing what flavors we can come up with. We love your site and find all your info very helpful. Thank you so much for the order. Got it today - incredibly fast. I started with Hannah's Special blend for the variety of flavor and the health benefits and I won't use anything else... email me! I will tell you how the issues that prompted me to start Kombucha are now behind me. I owe it to this blend. The Special Blend Tea is fantastic! I’m just now switching over to CB method and I can barely make myself leave the brew alone for a few days to ferment. It tastes so good! Count me as a customer for life for this product! Wow! What a great tasting blend. It will be a staple in my house for my Kombucha. I ordered this tea when I first started so I could have an easy time starting out and take the guess work out of which tea to use. Not only did that happen, but this tea is amazing! I love brewing it because it smells so good and my kombucha tastes great! I will be buying my tea from Kombucha Kamp again. Love the taste and quality. Shipped quickly too. Thanks! I really do enjoy this tea blend. I brewed my Kombucha with this tea and another batch of Kombucha with plain store bought black tea & there was a big difference in flavor. The plain tea Kombucha was lacking & my kids asked "What happened to the Kombucha?" Hannah's Perfect Blend really adds so much flavor to my Kombucha! Hannah's blend is amazing. The second I opened the package and the wonderful tea smell hit my senses I knew it was going to be delicious. Not only is the quality in the smell, but the look of the tea is superior. This tea blend is just heavenly! I had many friends who were skeptical when I told them that I thought my kombucha brew was better than GT's, but after one taste they were HOOKED! I've now inspired some new kombucha brewers thanks to this foolproof foundation tea. This is by far the BEST blend to make Kombucha with....not to mention, the scoby seems to really thrive in it. If you want a *perfect* tasting kombucha every time, this is the blend for you! I tried two different teas, Hanna's and White Peony. My favorite of those is Hanna's blend. It had a stronger flavor. We really love our Kombucha and so do our friends. Your special blend of tea is EPIC! Your store & service is professional & quick. I would give more but if 5 is all I can go then so be it,5 BIG shiny gold stars with a happy face like I get on my invoices. I have been making my own Kombucha for years. Recently, I started using Hannah's special blend. I love it! Much better than plain black or a black/green mix. I now only make Kombucha with Hannah's blend! I kid you not - this is the best tea I have ever tasted. I made extra sweet tea when I brewed my first CB batch and it was delicious. Now I have to hide it from my kids so that they don't make sweet tea and use it all up! I have been using Hannah's bend in my oak barrel continuous brew and my komboucha is perfect every time. It's so good that i haven't experimented with other teas. Why mess with success! At first I was reluctant to spend this much for this tea blend, but after using it for a while and comparing to the price of attempting to craft my own organic blend, I feel great about this product. It makes great booch, helps improve the health of my scobies, and is nice as an iced tea as well if I happen to make extra. I used it to boost the health of some of my scobies after accidentally using a tea that contained oils which left them looking damaged and weak... one cycle with Hannah's special blend and they perked right up and were back to thriving. Good stuff! The only thing I wish was different is that this tea comes in loose form, but most of the recipes go by number of tea bags to use, so you have to at first sort of just pack some in your tea ball and eyeball how much will be the right amount. But it works out fine and you will love the results. This is my favorite blend! A hint of apple or pear. Brewed w/ rose petals and a few raspberries! YUMMM! (I can't get the stars to stick; I'd mark this a 5 star! This is the best tasting tea! It is smooth and delicate-compliments the carbonation and the perfect "bite" of a mature brew. Thank you to Hanna and her crew for all the help (read four emails about how I was sure I killed my SCOBYS). Emails were detailed, kind and immediate. I am so blessed to have heard you on Undergroundwellness! I can't believe I make such good tea, batch after batch using your special blend. I've tried other teas and keep going back to your special blend. I finally quit trying other teas because I'm very satisfied with the results. Keep up the good work. You have good products, speedy shipping and great customer support. I wish you well with your business. This is an awesome blend of delicious, refreshing, and fragrant teas. I love the resealable and reuseable bag it comes in too! Hannah's Special Blend came with my brewer package. While we were waiting for the sweetened tea to cool enough to put in the brewer, I poured some into a glass over ice. YES! Absolutely the best glass of iced tea I've ever had. My daughter doesn't even like iced tea, but her eyes lit up when she tasted it. There's nothing like it. I'll be buying it more often this summer so I can have a pitcher of iced tea in the fridge next to the KT. My order arrived very quickly and I am impressed!! Thank you! This is by far my favorite tea for kombucha making and for just making a hot cup of tea. My cupboard is filled with different teas because I love tea. But after tasting Hannah's Blend, I never even try any other teas...they just don't compare to the taste or quality of Hannah's Special Blend. Thank you again Hannah for yet another superior product. I love all your products including this delicious and healthy tea blend!!! Yum, just ordered more of Hannah's Special Tea Blend. It is so fragrant. I'm not only using for my brew, I'm also making cup after cup of it to drink. A great coffee substitute. Thanks for another great product! I just love this tea blend! I ordered another pound so I'd have enough to start some more batches of "bouch"
I am so glad I found the kombucha kamp website/online store! I will be a regular customer; the special tea blend is delicious. I received your tea blend on 26th Feb 2014. I have brewing my kombucha successfully since. The brew tastes really good and my scobies are very healthy. Am very happy with the tea blend. When I bought my scoby I also got 1 bag of this tea mix, I loved it so much I bought another pound of it. I pricednit out to just mix my own and it would cost me more to buy it all myself, so the prices here are great as well. I love this blend! I am very pleased with Hannah's blend. I have successfully brewed my first batch and just began my second. I love the flavor combination and just how much bang I get for my buck. Delivery was very prompt! Thanks Kombucha Kamp. Love this blend of tea for my kombucha. It is a mild tasting tea and smooth. Will definitely continue to use this in the future. All I can say is THX Hanna for your awesome blend as well as your knowledge and service! If I could give this more than 5 stars I would because it has been BY FAR the BEST tea I have ever brewed with. My batches come out delicious every time. It's not heavy tasting, not too light -- it is perfect. It makes big fat babies every batch and is worth every penny. I don't know what Hannah put into this but it's like Kombucha magic. Seriously, I've spent so much money in the past looking for a good tea to brew with and this is hands-down the best. I haven't tried it as a plan old tea yet (because I save it for brewing) but I'm sure it's delicious. Also, the picture doesn't do it justice -- there are big beautiful leaves in the blend -- all whole, no dust. SOOOOO GOOD!!!! I love this tea blend!! It make a lovely cup of tea and some of the best bucha! This particular blend is my absolute favorite. I've been brewing for 6 months and have tried many blends out there from other websites and have found my favorite here with Hannah's Special blend. Always a quality brew! I received this tea complimentary with each of my scoby purchases, which I thought was very nice. In comparison to other organic teas I have used for KT brewing, Hannah's special blend definitely grows the biggest and best Scoby's. Thanks Hannah for hand blending this tea! My scobys also thank you! Your tea blend for Kombucha is so potent. It brews such a rich tea and the Kombucha that it becomes is the best I have ever brewed. How inspired of you to blend all those teas to broaden the nutritional and energetic benefits of my brew. This really is a special blend! I have tried using some other tea and I just don't have the same results. I will continue to buy this tea and brew with it. Hannah really knows what she is doing with Kombucha, so if she puts her name on it, i know it is a legitimate tea! Hannah's special tea blend is fabulous! I love the flavor and great Kombucha brew every time. It is a wonderful mixture of organic teas that blend together in perfect harmony! This is awesome tea! I was using other teas before getting Hannah's Special Blend, and I'm surprised at how much difference this tea makes, really yummy booch! On top of all that, I appreciate that it's organic. No reason to look any further, this stuff was great first time and every time! , I love your special blend. I have started 6 friends and all their kombucha was started with your special blend. When they have “gone off the wagon” and ventured off on their own teas…it just isn’t the same. Mine is still tops with your special blend. Thank you for all the info and for helping all of us get started on the road to super health. I love the cb and I love the tea...(your special blend) I make it as ice tea for my husband he also loves it. I am extremely happy with everything I have bought and the customer service as well. I am even thinking of getting a second cb as I love my kt. I just found some new recipes to use it in. I make drinks and salad dressings with my kt. I have even noticed that my eye sight had improved. So yes I would recommend your site and have already. I love the videos they really helped. Keep up the good work. Well balanced tea for great 'booch! I enjoyed this tea blend very much. It made for a great first and now second batch. It is very mild so I let it seep awhile longer on my second batch. My SCOBY seems happy as it's growing big and strong! 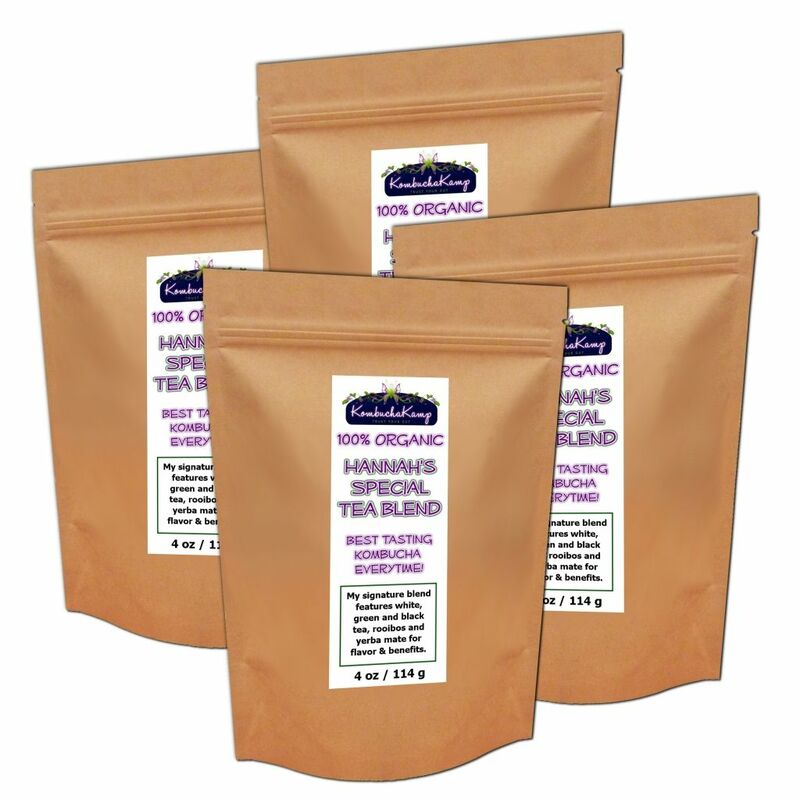 Hannah's special tea is the best tea for brewing kombucha tea. I ran out and had to use another and it's just not as good. I love the light but complex flavor this blend brings to kombucha. Plain booch is not so plain anymore! And it lends itself well to various added flavorings. I started using Hannah's tea blend, and it is awesome tasting! Plus it makes beautiful SCOBys. I am so glad I decided to try it. Give it a try you will love it! Hanna's site to get them started on the right track. I am so proud to be a Kombucha Kamper ! We really love Hannah's blend of tea. My husband said please order more. Hannah's blend produces a perfect brew every time. This beginning kombucha enthusiast could not be happier. I have not been sick since I started drinking Kombucha. I'm going on 6 weeks short of a year. This is HUGE for someone that has had chronic sinus infections for many years. Great tea and great scobies from Hannah. Highly recommend!! I love this blend; I've tried others, but keep coming back to this; perfect tasting kombucha every time. Best tea blend ever for Kombucha or for having a great cup of tea! This is my favorite tea- it makes the best tasting kombucha by far. I won't use anything else. And it makes the most beautiful scobys! I will be re-ordering the large size. I love this tea blend. It makes the best KT and also a nice cup of regular hot tea. The smell is lovely and balanced. LOVE Hannah's Perfect Blend tea. So many great health properties and the BEST tasting Kombucha! I had already been making kombucha but switched to using Hannah's Special Tea Blend. I gave a bottle of my kombucha to a friend of mine (who has been making kombucha longer than I have). She sent me an email that said, "Best. Kombucha. Ever." She wanted to know more about how I make my kombucha. I attribute the great taste of my kombucha to Hannah's Special Tea Blend. Thank you Hanna,i do not drink tea's but herb tea, we say bush tea, but that blend, Blended delisious. much more. cheers to a new blend for me, I'll place 10 stars to the tea. I love love love this tea blend. I have now bought 2 and 1/2 pounds of it. Perfect balanced Kombucha comes from this tea. I just LOVE this tea, and so do my scobies!!! They are huge and happy and I also love the little cotton bag! As other people said, I make the tea for my booch and then make tea for myself... Such a wonderful smell!!! I ordered this tea because it is organic and that is important to me. The blend is lovely and smooth. I haven't been brewing that long but this is my favorite tea by far! I like the taste of the Hannah's Special Blend tea, and plan to order it again, giving some of it to a friend to use as regular tea. The tea blend gave the KT a unique taste, and using a lot of it is not required for your brew. I am a tea aficionado and always experimenting and looking for a tea that is so versatile. I perused the tea selection when preparing to order my scoby. I purchased this tea purely on the basis of reviews. I'm happy to say it is all that and more. A very smooth tasting tea. I've yet to try it in my KT brew. It is so delicious that I fix a cup of it every morning instead. This is absolutely the best smelling and tasting blend ever! When I brewed my first batch, I was so excited over the heavenly smell of this tea! For the past 40 years I have not been able to drink regular tea because of the tannins in the tea which gave me severe stomach pains. I have no problem with herbal teas, so I was curious how I would react to this blend. No problem whatsoever! I can drink as much of the KT as I want and no after effects in my stomach! This blend is perfect! Thank you, Hannah! This is the BEST tea. I use this one most of the time and it always gives great results. I have purchached many other teas and they are likewise wonderful! I love this blend. My tea tastes so much better than the stuff I used to pay a zillon dollars for. I don't know if I will ever use anything different. The taste is light and flavorful. When it comes to loose tea, I am a "tea snob"! I am very happy with Hannah's Blend. I am especially happy using it in my oak barrel! The 2 flavors combined are amazing! The quality of the tea is quite nice. It's very fresh, and brews up nice and smooth. I am new at making kt. It was some what scary starting out as I was afraid I would ruin it. I ordered Hannah's special organic blend tea and oh my gosh - it was amazing!! I love it! This special blend is perfect and I wouldn't change a thing! We love this tea blend for making our perfect Kombucha! This was the first tea blend we used for our first ever Kombucha. After a time or two we tried goimg with organic store bought green & black tea, but were disappointed in the results. We went right back to Hanna's blend and are so happy we did! This blend is definitely my favorite. I drink it hot with raw honey and also use it for my oak barrel kombucha. A little bit goes a long way. Order this tea! Your body and your SCOBY will thank you. I purchased a bag of this tea blend recently after receiving a sample of it with the SCOBY I also purchased here. This tea blend is delicious and produces excellent KT! I intend to buy more when I run out!! Hanna's Special Blend is the best. I'd never used loose tea before but the tea ball makes it so easy. My scoby are thriving on this tea. This tea blend is delicious and allows for a perfect kombucha brew each time. I just ordered a full pound of this yummy stuff and will continue to reorder--plus the customer service and shipping times are phenomenal! All the way to Hawaii in just a few days! Thanks, Hannah! LOVE LOVE this blend!! I didn't start using this but will from now own! It makes some of the best KT I've ever had!! I will be recommending it to my kombucha-brewer friends for sure! I love that it is organic. That is a very important aspect to me. Never having heard of Kombucha and being thrilled at the health benefits I read about I was intrigued. I stumbled upon Hannah's website and decided to jump in, I bought the starter kit and have been Kombuchaing about 4 months...I love it. I have gotten 3 friends started and the tea combination of Hannah's special blend just can't be topped. We all love it.I enjoy the experience and the sweet smell of the brew... Thanks so much Hannah! The blended tea that Hannah provides in the "No Frills" package is remarkable. I have used it for two batches now and the flavor is wonderful. She uses all kinds of different teas to make a really interesting and delish Kombucha. We have tried blending our own teas but this is by far the best! Love it! Wow, so I ordered this so I could get free shipping on more of the wonderful bottle caps. I adore this stuff and my brew isn't even finished yet. I have tasted it a few times to check it and I cannot explain the taste but it reminds me of flowers. I am not even sure I want to flavor this one, it is so delicious. But more than that, I have NEVER had so much fizz in my brew only 3 days into the brew. I may be hooked on this one ;) Give it a try! I really didn't care to try to figure out the best type of tea to use, so I went with this special blend and have been happy with it. It smells wonderful and makes great SCOBIES. I will definitely be getting more of this. Love the flavor and the fact that it is organic. I've been using Hannah's Special Tea Blend for all of my batches and it is superb! I love that it is organic and the developed to be an ideal blend for making great Kombucha. I wouldn't use anything else! This tea keeps my SCOBY healthy and growing like crazy. It does have a little too much green tea taste for me, but because of its health benefits I just add 1/2-1/3 t. black tea and it's terrific! I will buy it again. I LOVE this tea blend! Just the right balance of tannins and flavor! I have also enjoyed it hot. Yummy! Fantastic results on the first try!! I ordered more right after I tasted the results. So far we've used Hanna's Special Tea Blend as well as some of our own tea concoctions , and nothing so far has compared to the flavor of Hanna's. It has a great balance of flavor and smoothness. We love the benefit that it is organic too. Hannah , I just love the flavor of this tea - I didn't think my KT would come out as good as pre bottled ! This blend is wonderful...lots of interesting notes! I'm a novice brewer and used the complimentary bag for my first batch. Delicious! So much so that I ordered a whole bag! I highly recommend it!! This blend is delicious, reliable, and, most importantly, organic. It makes tasty kombucha AND a great cup of hot tea. The continuous brewer moved across the country with me. Hannah's special blend has been the absolute best. I look forward to making the next batch of nutrient solution so that I can use the leftover tea leaf mix to brew one more cup for me! The tea makes a very tasty kombucha. The tea blend had very good flavor and I'm becoming more addicted to it! Best tasting Kombucha Tea blend. I also love to add the ginger sold here during bottle processing. strong ginger taste which I love. This special blend is perfect for making authentic Kombucha. I just completed my first batch and everyone loved it and wants more. I am ordering this tea for all future batches. It also makes for a great cup of hot tea. This tea takes out the guesswork for me and it's the best. This special blend makes excellent Kombucha! This is the best blend for Kombucha. I really like the flavor and that it is organic and Fair Trade the price is rather nice too. Good job Hannah!!! we Love it!! This tea is the absolute best tea to use for KT. It is the closest blend I've used that tastes very similar to a popular store bought brand. I will definately be purchasing this again. Hannah's Blend makes great kombucha. I only use it and Oolong. Another plus is that Hannah's Tea is organic and reasonably priced. I really like this tea, and I have used a lot of different ones. The SCOBY especially seems to like it more than the other teas I have tried. This is a very tasty tea blend. We love it! This set the standard of quality for me, and now nothing tastes as good! Great product, can't wait until my next shiment! For those of you who have tried making kombucha in the past and just can't seem to come across that flavor that we love about our store bought kombucha, here is a tea that will one-up that. This is also a perfect blend that utilizes multiple types of tea for all of their varied health benefits. This is great, the KT is wonderful and yes I believe the SCOBYs love it. They grow so big so fast, and even in my hotel the SCOBY has formed a giant baby with this tea. I love it too just as a tea drink though sometimes I add an extra tsp of rooibos just to help with the mental facilities. I usually brew for the SCOBY and then put more water in and get a second brew from Hannah's blend, this I drink most of the day with some KT added, yum yum. I will be ordering more. Thanks Hannah. This is THE ONLY tea I've used as the base for my KT since receiving my CB system a few months ago. Not only is it delicious tea to brew and drink -- it makes a wonderfully tasty KT! I can't see using anything else. Perhaps I'll become more adventurous as I become more experienced. But right now, THIS special blend is MY FAVORITE! Wow!! This is so yummy. Best blend ever. We can't wait to get some more!! Hannah's blend is pretty good, I've only had it as hot brewed tea and not in kombucha yet, but I have great feelings about this tea! Hannah's Blend is wonderful, it is a great tasting tea, and I will continue to buy more. This tea blend makes the most delicious kombucha. I received a generous sample bag with my order of the No-Frills Continous Brew Kit. This makes kombucha better than the store-bought versions I've tried. I'll be ordering more! I stopped brewing kombucha for about 7 months because I just couldn't find a tea at the grocery store that I liked. I had been wanting to try this blend for a while but was put off by the cost. I am SO glad I finally sucked it up and bought some of this tea because it is the BEST! This tea makes a beautiful, great-tasting brew. Worth every penny! I had to try this blend after seeing this many good reviews, after trying it I can say it is worth it. A drastic improvement compared to store bought tea bags! Hannah was kind enough to send me a sample of this tea in a little reusable tea bag and I must say its AMAZING! I will definitely be purchasing more when my black tea runs out! Thank you so much for sharing your amazing tea!! This tea blend is absolutely delicious. I am new to home brewing and was very skeptical that I could make something that tasted as good as the GT's store bought brand. Was I surprised! This blend not only makes wonderfully delicious kombucha, but makes excellent tea as well. Plus it's organic and fair trade! I have no reason to try anything else. I'm a very satisfied customer. Thank you, Hannah, for your fabulous blend. I recieved such a large and wonderful looking scoby and my first batch with organic green tea was fantastic. (I bottled with a small amount of ginger) I am drinking the second batch with your blend and that was over the top! I use a seed starter mat to keep the KT brew warmer in the winter and it seems to work but takes 2 weeks. Thanks for everything. This special blend of Hannah's is superb! The brew I'm getting from using this blend tastes better than anything I have purchased at the health food store. Thanks to Hannah's special blend I have the best tasting booch in town! i ordered the blend after using a lot of different combinations of my own.....why did i wait so long??? it's so delicious - so light - so smooth - makes all the difference in the world. I'll never go back! It's worth the investment for a great taste! I've come to think of my scobies as sort-of pets. As such, I want to take care of them the best I can. They LOVE Hanna's Special Blend. The babies produced are noticeably thicker, stronger and have a more consistant texture than without it, and the brew finishes a 1-2 days sooner. The nutrients in Hanna's blend clearly meet the nutritional needs of the scoby better than pure black tea. I will definitely continue to use it; I'm brewing a batch of pure Hanna's blend now. * side note - as I was typing, one of my girls came to me and said, "I just can't wait, is there any kombucha ready? I love it so much." I love this tea. The finished brew tastes EXACTLY like a store bought name brand (that shall remain nameless). I had bought a few bottles as starters and tasted mine against store bought and it tasted EXACTLY the same. I feel bad for people that waste money on stuff they can make for way cheaper!!! 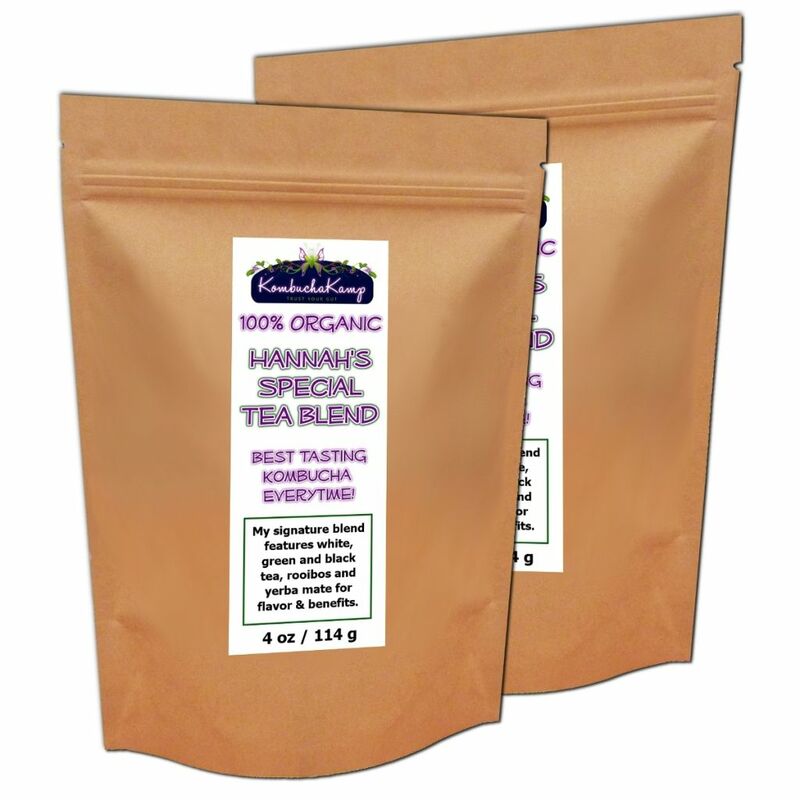 Hannahs blend makes fantastic Kombucha and also makes a wonderful cup of hot tea on a col Wisconsin morning! I am offically hooked! Hanna's special blend lives up to its name! I'e been using Hannah's special tea blend and it has been great. It came with my continuos brew package. This tea is fantastic! It makes delicious KT. Will be buying more when I runout for sure. Thanks for sure a great product! Since this is my first batch of tea blend for kombucha, I can't compare with others. However, the fragrance of Hannah's blend is delightful and so far our end product is delicious. Waiting for our third brew right now. It's been about 13 days; brew is still a bit sweet for our taste but close. Thanks, Hannah, for quality products, great education and the best ever customer service! I am a new kombucha brewer and this tea has tasted and brewed great. I plan to continue using Hannah's special blend for a long while! I'm very pleased I decided to purchase this tea. I'm relatively new to brewing Kombucha & am currently on my third batch. So far everything has turned out just great, and I think it really is because the SCOBY loves this organic blend! First off...I have been drinking tea(I make) for over 20 years. I have ordered it from literately every country in the world. I even have my own special blend which is a mixture of my favs. I ordered some of Hannahs and OMG this isn't even close to describing it. I made a cup for our tea tester daughter and she said the same thing "OMG" Just between you and me, this puts my secret recipe to shame and way cheaper than my conglomeration. I just received my second pound of this tea. It is really wonderful. The tea blend is fantastic! I was hesitant to spend the extra money b/c of my tight budget but I am so glad I did. The kt brews to a flavor profile that I just love. Thanks, Hannah! After starting out with this blend, I tried many different teas to make my kombucha, and have decided to keep it simple and use this blend exclusively. The flavor is wonderful! Thank you. I've experimented with several different teas and I keep coming back to Hannah's special blend. It makes by far the most mellow, all around best tasting kombutcha I've had, hands down! I still like to try different teas, but this will always be my main kombutcha tea. Can't go wrong with this one! Thanks Hannah! This is really the best way to get started. the flavor is a perfect meld of everything. it isn't too bitter, too weak or too "healthy" tasting. it comes out great. we love it. it's a great way to start because you have an awesome base to judge the rest of your tea mixing concoctions. regardless of what i try, i always come back to this one as the best. I have found that this is one of my favorite tea's for making my kombucha! I make 8 gallons a wk and all my kids drink it. They have all told me they do much better in school when they drink a glass of Kombucha with their breakfast! This reeeeally is a great blend! My favorite flavor I've tried. I drink right out of the brewer after 7 days... a little here and there while I'm waiting for the brew to complete in 12 to 14 days. Great Tea Brew! My 1st and 2nd batch of Kombucha tastes great, similar to the Kombucha that I paid $4 a bottle for. I'm enjoying the savings now! Thanks Hannah! I love this tea blend! It makes the BEST kombucha and it's organic and fair trade too. My scoby thrives when I use this blend. Give it a try, you won't be disappointed. I was afraid I wouldn't like the homemade kombucha as much as GT brand I was drinking. This tea is WONDERFUL! My husband and I cannot get enough. Guess the next step is continuous brew system!! People, please save yourself a ton of trouble and get this tea blend. The scobys grow great and the tea tastes delicious. I've found steeping the tea extra long when making Kombucha gives it a deeper flavor that I prefer. BTW, Hannah, I love your site! I tried this tea that came as a sample with the scoby I ordered about 6-8 weeks ago and it was delicious. After trying different teas on my own, none tasted as good as this blend so I ordered it even though it is expensive and I love the Kombucha it makes. The reviews are right, the scoby does seem to love it as the babies made with this tea seemed more solid/stronger than with other teas. I just served my husband Kombucha using the Kombucha and Hanna's tea blend. He said it was fantastic!. It took a few cycles to get the kombucha going but now it is delicious!!!! Hannah's blend produces a perfect brew every time. This beginning kombucha enthusiast could not be happier. The tea I received with my kit was fantastic. I will be ordering more very soon. Organic is very important to me and the flavor this tea makes my Kombucha taste wonderful. Thanks! I think maybe this whole Kombucha thing is a front for her tea operation because ever since I tried it and gave some to my girlfriend and her mom I've had to buy this stuff by the pound just to keep up with demand. Best thing is it comes in 4 ounce packages so I can order a few of them to save money and dole them out as necessary. I admit I enjoy a cup myself with sugar and a splash of milk. I have to admit that I was tempted to use my own tea but after reading about how temperamental the culture is, I decided to follow Hannah's advice. This is a great blend that turns out perfect every time! The tea smells amazing and the bacteria seem to LOVE it. Eventually I hope to make my own bulk tea. In the meantime Hannah's Special Blend is wonderful and exactly what I need to make my delicious and healthy KT. I was a little bit hesitant about purchasing Hannah's tea because of the cost. But I read the reviews, and especially here at the beginning, I wanted to get started off well, so I bought 1 lb. I am drinking my first glasses of home brewed, continuous brew kombucha, and don't regret getting her tea. The layers of flavors are so great and the tea smells great too. 1 lb will last a long time, and is still economical in the grand scheme of a consumer's life! When I ordered a pound, I got 4 packaged 4 oz bags which I loved, because it will keep the tea fresher longer. Being new to brewing Kombucha, I'm appreciative that Hannah has taken the time to create a blend of teas with these qualities. My KT is delicious. It's a great way to start. I'll experiment with other teas as I learn more. I like the concept of supporting various health conditions with specific teas....targeting seems smart! I really love this blend of tea. I thought when I first purchased it I'd just figure it out and buy the ingredients from my local tea shop...but I will continue to buy Hannah's Special Blend since it tastes so good in my kombucha. I have used all of the types of tea that are in Hannah's Special Tea Blend but I must say, the way she had put this blend together produces not only a great tasting Kombucha every time but it is also a great tasting tea when I feel like making just a cup of tea alone. WoW This tea is gooooooood!!! Super fast shipping even all the way down under and makes it through customs without issues!!! This tea is perfect! After I make tea for my new batch of kombucha, I don't throw away the tea, I make a gallon worth of tea with Hannah's special tea blend and let me tell you, it gives me a lot of positive energy and it clears up my skin. The next day I wake up with less pimples and it makes me very happy! so I been drinking it and my skin is almost perfectly clear! Thanks Hannah! This tea blend is so tasty! I've had other homemade kombucha and it wasnt nearly as good as this tea makes mine! I love the flavor and it is just as delicious every brew! Hannah's perfect blend really is perfect! This blend makes the BEST brew... I love it!!! Hannah's Perfect Blend is DELICIOUS!!! I only wish I could get it in bigger quantities. The SCOBY's love it too. This is a great tasting organic blend of tea! The Scoby seems to love it as it is growing bigger by the week. A very smooth but noticeable blend of flavors make this tea taste great. It's also good when served hot or iced.